Like many kitchen appliances, we often don't realize how much we rely on our garbage disposal until it stops working. Sometimes the problem can be easily fixed by pressing a reset button or removing a bent spoon that was accidentally dropped inside. At other times, though, the unit is too badly damaged or has worn out and needs to be replaced. Luckily, removing an old disposal and installing a new one is not all that difficult. First, turn off the power to the disposal at the main service panel, and unplug it if it's plugged into an outlet. Use a screwdriver to remove the electrical cover on the bottom of the unit and check the wires with a multimeter to be sure the electricity is turned off. Then disconnect all wires, including the ground wire. If the dishwasher drains into the disposal, loosen the hose clamp and pull the dishwasher drain hose off. You may want to have a small bucket handy in case there is water in the hose. Then remove the bolts connecting the drainpipe to the unit. Loosen the three bolts holding the mounting ring to the disposal. While supporting the disposal from the bottom, turn the mounting ring counterclockwise with a hex wrench until the unit drops free. Chances are, you won't need to replace the old sink flange because disposal mounting brackets are around the same size, meaning the new disposal will fit right onto the old flange. However, if you choose to replace it, the first step is to remove the snap ring. It's located in a groove in the flange, and using a small screwdriver to pull it down and off is usually the easiest way to remove it. After the snap ring is removed, the mounting bracket and sink flange will pull right off. Roll plumber's putty on the underside of the new sink flange and press the flange firmly into the sink drain hole. Slide the fiber gasket and backup flange onto the sink flange from below. Then put on the mounting ring and set the snap ring into the groove of the flange. Tighten the three mounting bolts until snug. Because the wiring is on the bottom of the disposal, it's easier to wire it before installing the unit. It's simple – remove the electrical cover, join the black wire and the black lead with a wire, and do the same with the white wire and lead. Tighten the ground wire under the ground screw, and replace the cover. If you are going to connect the dishwasher drain to the disposal, there is a seal inside the dishwasher fitting on the side of the new disposal that you'll need to knock out with a screwdriver. Place your hand inside the disposal to catch it. Then you can attach the dishwasher drain hose and tighten the hose clamp. 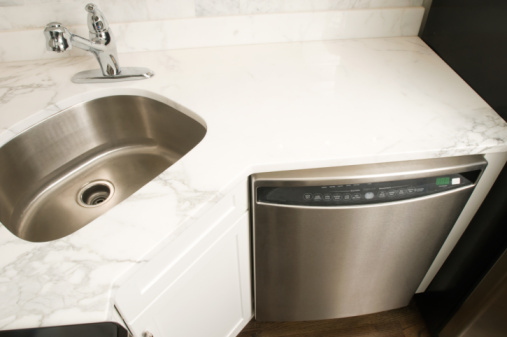 Lift the disposal up to the mounting ring and turn the ring clockwise to engage the tabs. Tighten the mounting ring by slipping a hex wrench into one of the tab slots and turn counterclockwise. When the disposal is secure, slip the metal flange and then the rubber washer from the drain outlet onto the drain pipe. Insert the pipe into the outlet and tighten the fastening bolt through the flange. If the disposal you are installing is a different model, you may need to trim the drainpipe to fit. After the disposal is installed, plug it in or turn on the breaker, run some cold water and give it a try. 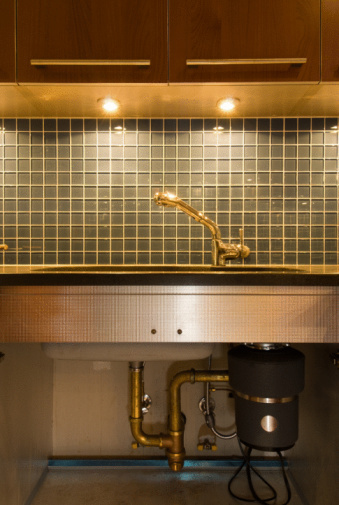 Gary Sprague is a master plumber with more than 25 years of experience. His articles have appeared in many online and print publications.